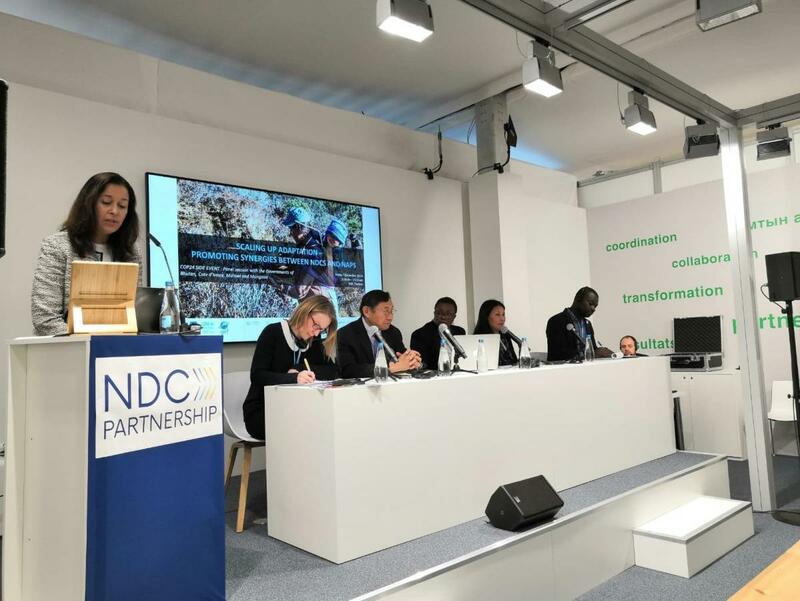 At this COP24 side event, panellists from Bhutan, Cote d’Ivoire, Malawi and Mongolia explored the synergies between Nationally Determined Contributions (NDCs), National Adaptation Plans (NAPs), and Long-term Low Greenhouse Gas Emission Development Strategies (LTS). This was an opportunity to visualise the current state of play in aligning NDCs and NAPs, whilst considering key opportunities, gaps and challenges. 7 December 2018, COP24, Katowice, Poland: A side event entitled ‘Scaling up adaptation – promoting synergies between NDCs and NAPs’ was convened at the NDC Pavilion by the Global Environment Facility (GEF) funded joint UNDP-UN Environment National Adaptation Plan Global Support Programme (NAP-GSP). This COP24 side event focused on exploring the synergies between Nationally Determined Contributions (NDCs), National Adaptation Plans (NAPs), and Long-term Low Greenhouse Gas Emission Development Strategies (LTS). This was an opportunity to learn from country experiences from Bhutan, Cote d’Ivoire, Malawi and Mongolia, to visualise the current state of play in aligning NDCs and NAPs, whilst considering key opportunities, gaps and challenges. Moderator Jessica Troni, Adaptation Portfolio Manager, UN Environment, opened the session with an overview of the current state of play with NAPs and NDCs. She underlined how NDCs are at the heart of the Paris Agreement and the achievement of the long-term mitigation and adaptation goals therein. NDCs embody efforts by each country to reduce national emissions and adapt to the impacts of climate change. She also reminded everyone that the Paris Agreement also states that Parties should periodically submit an adaptation communication to the UN Framework Convention on Climate Change (UNFCCC), as part of, or alongside, other communications or documents, such as a NAP, NDC and/or national communication. Rohini Kohli, Lead Technical Specialist, NAP-GSP, UNDP reflected that the majority of developing countries have included an adaptation component in their (I)NDCs. Scaling up adaptation under the Paris Agreement is also a key priority. She outlined the landscape of the various climate planning instruments and demonstrated some differences and linkages between them. There are some overlaps – and some distinct elements. NAPs are medium- to long-term, and they tend to not be quantified. NDCs are concerned with mitigation, with adaptation elements in many countries as well as co-benefits. LTS contain high-level goals and milestones until 2050. All three are cross-sectorial. She explained that UNDP is supporting NAPs though a range of initiatives such as in-country NAP projects supported by the GEF and GCF, the joint UNDP-UN Environment NAP-GSP, and through collaboration with the UNDP NDC implementation support programme. The joint UNDP-UN Environmnent NAP GSP actively coordinates with the UNFCCC and the LDC Expert Group and with other partners such as FAO, WMO, UN HABITAT, GIZ and others, and the NAP Global Network. Mozaharul Alam, Regional Coordinator, Climate Change Programme, Asia and the Pacific Office, UN Environment, reflected that these are all planning instruments which governments can use to formulate the best outcomes for their contexts. Tawonga Mbale-Luka noted that when the NAP stocktake was conducted, poor coordination was identified across sectors. This was identified in the National Climate Change Policy in 2016 and a Climate Change Committee was subsequently set up, composed of multi sector institution chaired by the Ministry of Planning and Economic Development. Below that, there is a Technical Committee on Climate Change – which provides a way to share information and initiatives, build synergies and avoid duplication. There is also an Adaptation Expert Working Group. In addition, there is scope for for specific thematic groups in adaptation below the technical group – in various thematic areas. Santoni Oreste Akossi, Assistant Director, Renforcement de capacités et Finance Climatique à la Direction de la Lutte contre les Changement Climatiques (Climate Finance, Department for Climate Change), Environmental Affairs Department, Cote d’Ivoire, indicated how in Cote d’Ivoire, there are many initiatives, programmes, strategies and policies in place, all in accordance with the objectives of the Paris Agreement. However they continue to struggle with co-ordinating all the various institutions that have been created. They are in the process of developing a Coordination Unit - the National Commission – which will support coordination. Jessica Troni opened the floor to questions. Sameera Savarala, Climate Change Analyst, UNDP, asked how countries are collecting data and tracking progress on NAPs and NDCs. Tawonga Mbale-Luka explained how in Malawi, most adaptation planning and implementation is happening at the district level. The districts previously utilised their own adaptation planning frameworks. More recently, a pilot project is being implemented to develop adaptation plans to be fed into district development plans, utilising adaptation mainstreaming guidelines. It is hoped this will be phased out to more districts in a systematic way. These district adaptation plans are informed by the national-level policy and planning instruments. He elaborated that in Mongolia, the NDC is considered mainly a national level ‘top down’ process, whilst the NAP is about community needs and a ‘bottom up’ perspective. Jessica Troni concluded the discussion with acknowledging the challenges that can sometimes emerge from dealing in multiple acronyms (NDCs, NAPs LTS…) She noted how countries are visualising and using the different planning instruments – and how effective NAPs involve downscaled implementation at local levels. She reiterated that all developing countries are in need of improved climate information and risk data. In essence, the key linkage is that NAPs and NDCs are iterative planning processes which are most effective when driven by the best science. These vehicles can be used to develop information and priorisation, and the processes to formulate and implement NDC and NAPS can inform each other. Viewed together, these instruments can support countries as they forge adaptation strategies with more certainty and with more guarantee of effective resilience-building.